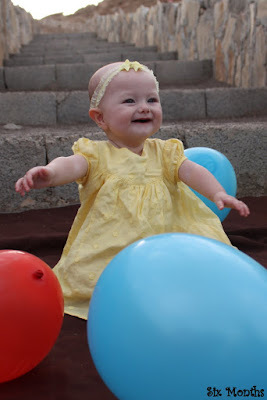 Far More Than Rubies: Happy Six Months, Grace! This is 10 days late but we had to wait for the weekend after she turned 6 months to take her pictures! Clothes: At five and a half months, I changed all of Grace's clothes out, not because she had outgrown her 0-3 months, but because she was 5 and a half months old and still wearing 0-3 months! I was worried that she was going to grow all of a sudden and jump right over her 3-6 month sized clothes! Stupid, I know, but I was also ready for something new! Food: Grace nurses every three hours from 7 am until 7 pm, and dropped her dreamfeed at the beginning of her 5th month! I pump at night so that she can have her 10 am feed at daycare. We send 4 tablespoons of rice cereal to school, and she eats 4 tablespoons at night before her bath. Sleep: Grace is completely deswaddled and around September 7th, began sleeping through the night, 7pm until 7 am! I think dropping her dream feed has let her sleep more solidly, and longer! She doesn't really nap at daycare, for the entire five hours that she is there (sometimes she'll get in a couple 10 minute cat naps, because they don't know how to put her down without letting her fall asleep with a bottle,) but she comes home and sleeps for 2 hours, wakes up for an hour, and then sleeps for another hour. Activity: Grace learned to sit up, unpropped, this month on September 21st. She will play by herself on the floor, reaches for people, and she finally learned how to roll over from her back to her tummy. Personality: Grace is an observer, she loves to look around her environment. She is a very happy content baby but likes to be held/played with all of the time when she is awake. She became very Mommy attached this month, sometimes not even liking it when Ian holds her. She shrieks very loudly but is not yet making any syllable like sounds. *Grace makes a piercingly sharp shrieking noise, and we affectionately call her our little Naz'Gul, which is the black riders from Lord of the Rings. Except, she isn't the harbinger of death. *She has really fallen into her bedtime routine. She gets so excited when we start it because she knows sleep is near. At 6, we begin feeding her cereal, followed immediately after by a bath, lotion, and footie pajamas (a must for her!) Then she nurses and I lay her down in her crib awake. I pop in her pacifier and hand her her "deal" blankets, two little burp rags that she holds onto. She rolls over onto her side and is immediately asleep! Grace, my beautiful baby girl. Every day your personality becomes bigger and bigger. Your smile lights up our lives and you bring so much joy into our lives. I pray every day that God will keep your "heart beating, lungs breathing, and mind functioning through the night" so that you can face another day with your sweet adventurous spirit. love her sweet smile! she's getting so big! The pictures are beautiful! That is so awesome that she can sit up on her own- I can't wait for E to be able to do that. I'm pretty jealous of your ease with bedtime. Emerson goes down great for naps but she fights bedtime like no other. I'm hoping it's just a little phase... :) Happy 6 Months to your sweet baby girl. 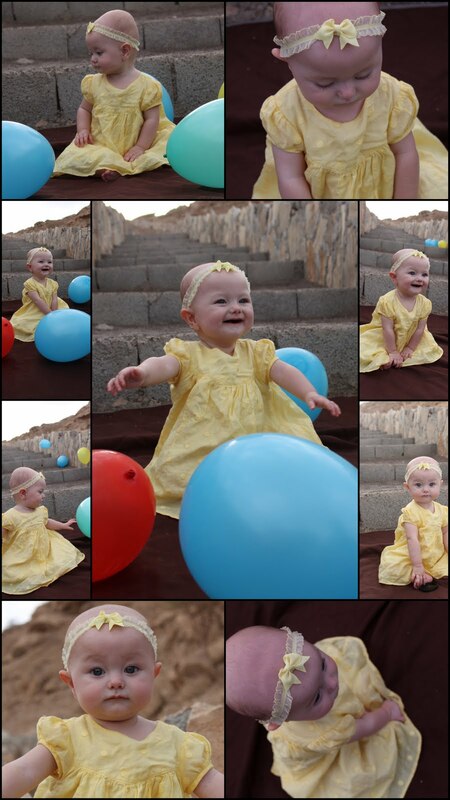 Love the pictures with the balloons! Glad she's sleeping so well.